The EB-535W delivers superior-quality images and a host of additional features as standard to give users more for their money. Ideal for classrooms or small meeting rooms, this projector can be wall or ceiling mounted or placed on a table close to the wall to free-up more workspace. Complete with our 3LCD technology, the EB-535W displays superior-quality, bright images with more accurate colours. The image can be seen even in brightly-lit rooms thanks to an equally high white and colour light output. Image detail is clear thanks to a high contrast ratio and our new short throw lens means sharper images and improved focus. The lamp in the EB-535W now lasts up to 10,000 hours in eco mode. 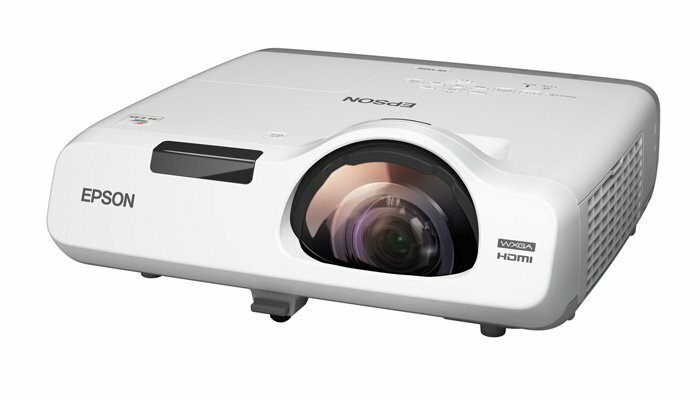 The projector even conserves power during presentations by automatically adjusting the light output depending on the content. The A/V mute function pauses the presentation and dims the lamp by 70% to conserve energy while the projector is not in use. The projectors’ built-in 16w speaker means audio content can be played directly through the projector, without the need for additional external speakers. The microphone input transforms the projector into a PA system, meaning presenters can be easily heard in a classroom environment. The EB-535W has both horizontal and vertical keystone correction to achieve a perfectly shaped image and help avoid distortion. When setting up several projectors, the OSD settings can be copied from one projector to many others meaning you don’t need to set up projectors individually. Multi-PC projection software allows content from four devices, including PC’s, tablets, smartphones, to be displayed simultaneously.